In the world of blogging, newbies often hear or read about popular platforms like WordPress or Blogger. However, because you are reading this post, it means that you have done your research and want to try out a more simplified blogging platform, such as Ghost. This free open source blogging platform is the brainchild of John O’Nolan who founded WordPress, a complex blogging option, while he worked as the deputy lead for the WordPress User Interface team. Despite Ghost being a relatively new blogging site, it offers a variety of well-designed themes, much to the delight of both newbie and professional bloggers. The Ghost theme developers, or “authors”, have focused on simplicity and readability, while designing some stunning themes. We have done an in-depth study of the numerous Ghost themes available on the Ghost Marketplace, Github, Themeforest or even the Creative Market. This has helped us come up with a list of high utility free and paid Ghost themes. 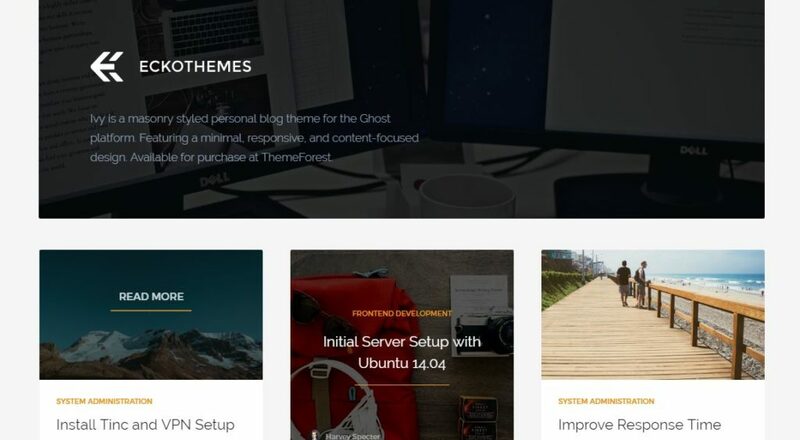 In this article, we discuss the features, pros, cons and pricing of the top Ghost themes that can be used for blogging. 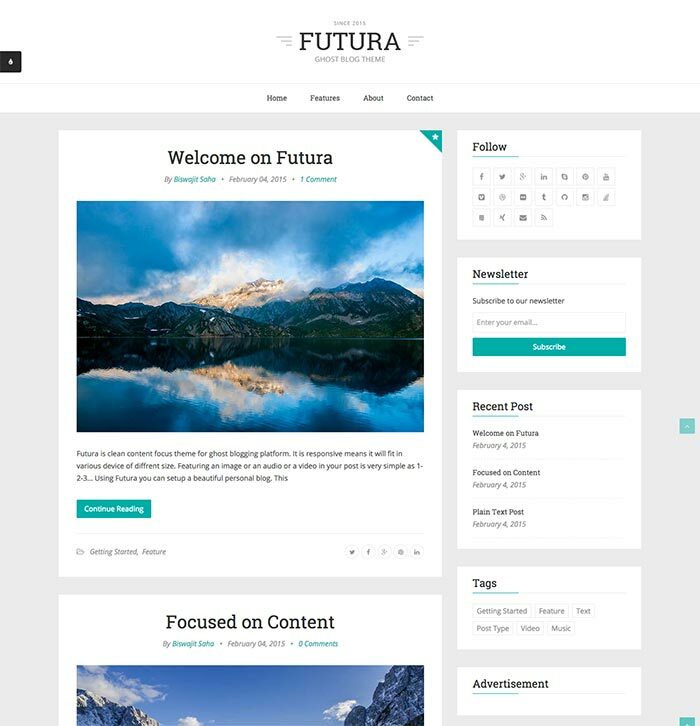 If you completely focused on blogging and want to make the optimum use of the pages on your blog, then the Futura premium Ghost theme helps you do just that. 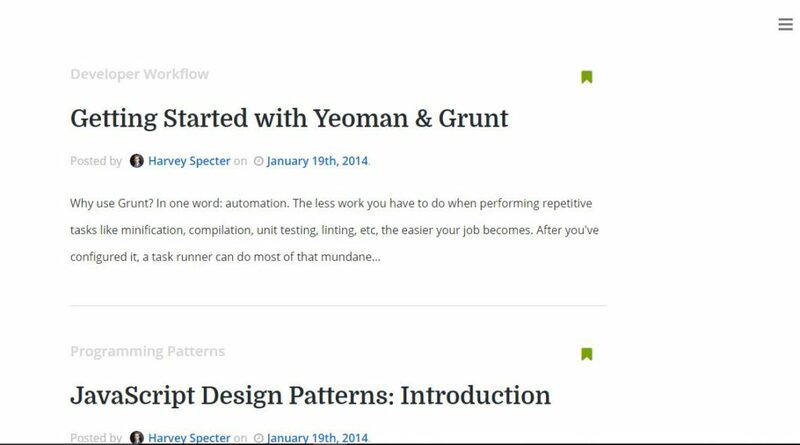 With the minimal framework and clean design, this modern Ghost theme pays attention to the content aspect of your blog. This paid theme by GBJsolution is best for those who wish to create a beautiful personal blog or a blog based on travel, hobbies, certain tutorials, and so on. The best part about this theme is that you can customise the theme design as per your blogging niche. The theme framework also offers good space and typography, with common elements being placed in such a way that any blogger will feel satisfied. Moreover, you can easily add images or videos in the wide post area made available to you with this theme. Even the sidebar offers plenty of widget options, which can be added or removed very easily. And, you can have an easy-to-navigate menu for up to two levels. From the media perspective, you can even have easy featured image, Vimeo, YouTube, SoundCloud or Mixcloud. Any other object (<iframe>) can be a featured media. The regular license starts at $24.00, which includes six months’ support by GBJsolution along with $7.20 for a one-year support extension. Has multi-user readiness, allowing you to create a multi-user blog with minimal effort. 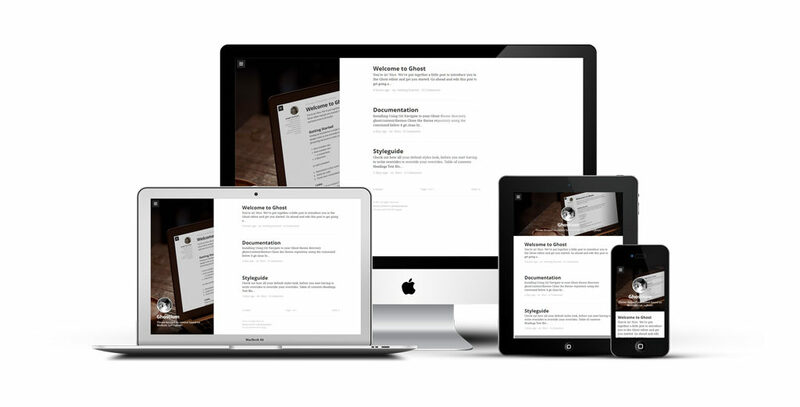 Is 100% responsive which makes your blog totally readable across all devices, irrespective of the screen size. Offers you the ability to set the “previous post” and “next post” link in the same post view. Offers Font Awesome icons (retina ready) and nice code highlighting. Offers Disqus comments and cross browser compatibility. Has a table-less and image-less design. Offers support for two-column layouts, which is not suitable if you require more columns in the layout or maybe a full-scale grid layout. This paid Ghost theme enables you to create your own photo blog and express your thoughts through videos, images, articles, and so on. This theme is clearly more focused on visual presentation with minimal style. 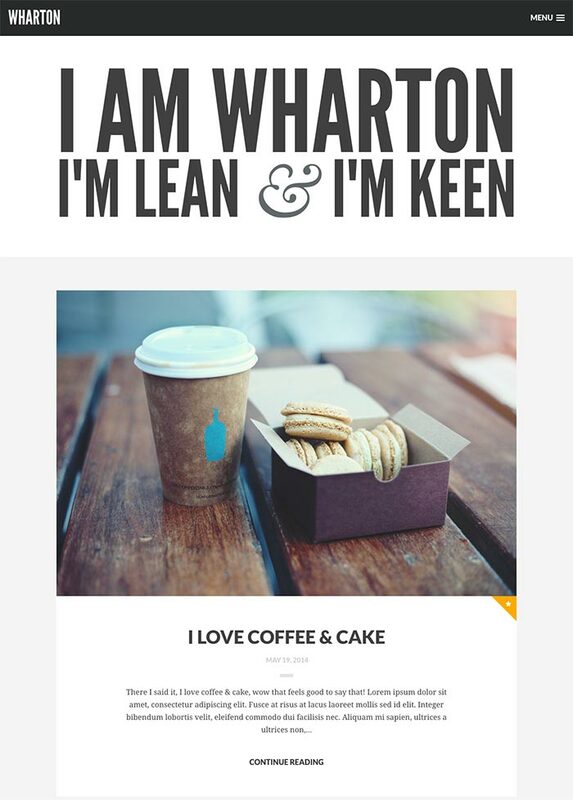 The Wharton theme by MeanThemes is simple and lightweight. Yet is also quite bold! It offers some beautiful typography options with large, bold text. The layout is based on a single column for this theme. The regular licence starts at $19.00. Offers you the ability to insert full-width header image per post or page. Has a full screen menu overlay that is compatible with all your mobile devices, indicating the theme’s fully responsive nature. Offers you the flexibility to add social media icons within your blog posts or even in the footer. 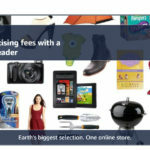 Offers you the ability to use a standard inline image or wide insert image to create more impact. Does not offer support by the theme author. This premium Ghost theme offers a modern card-type layout. It is a content-focused, masonry-style, modern theme which means that the common and most required blogging elements are placed in the optimal position based on the available vertical space, which resembles to some degree the mason fitting stones in a wall. GBJsolution also offers the Orbit theme and it resembles the Futura theme in terms of several high utility features, such as MailChimp subscription support, high customisation, quick and powerful search, cross browser compatibility, static pages, author page, tag page, and Disqus comments. The regular licence starts at $24.00, which includes six months’ support by GBJsolution along with $7.20 for a one-year support extension. Is 100% responsiveness which offers compatibility with all screen sizes, across all devices. Is a multi-author blogging platform, allowing multiple users to contribute content with ease. Supports Google font and retina ready Font Awesome icons. Has an image-less and table-less design. Supports more than four columns. Last updated in March 2015, which means that not many features have been added for a long time now. Documentation for this theme is “Unrated” on Themeforest. This paid Ghost theme offers a highly responsive design with masonry layout, which is optimal for use of vertical spaces available for placing key elements. This ensures that your posts are laid out in a very organised way that is pleasing to the eyes. In this sense it is just like the Orbit theme discussed above. With the Ivy theme, you can select any of the light or dark style options. The theme is robust when it comes to the options it offers, with seven post formats for every content type you can think of and plenty of flexibility within each designed block. It also allows seamless interaction with your blog readers through support for Disqus and Google+ comments. You can also use any of the three page layouts, such as full width, right sidebar or left sidebar. It also extends support for more than 420 Font Awesome icons, three widgetised sidebars (post, drawer and page), and more. The regular license starts at $19.00, which includes six months’ support by EckoThemes (the theme creator) along with $5.70 for support extension to 12 months. 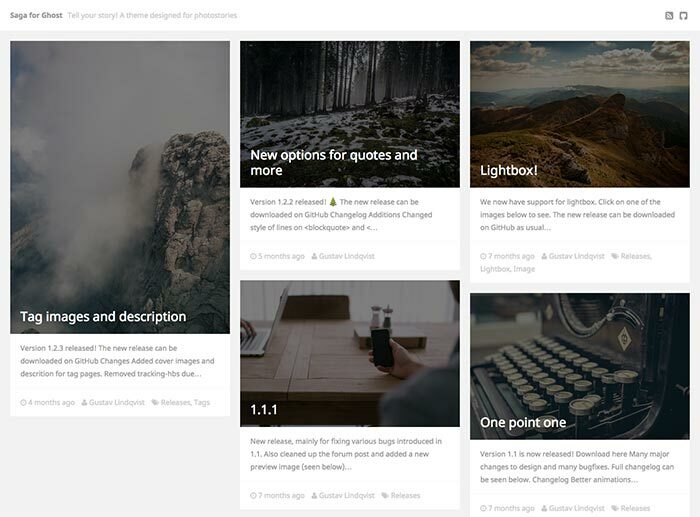 Is a robust theme with support for seven post formats, such as images, audio, videos, galleries, quotes, standards, and statuses. You can thus cater to any content type and change the format as per your needs. Offers you the ability to easily switch between the light and dark theme styles by observing the look in “live preview”. Has built-in social networking profiles and sharing links on your blog. Offers automatic syntax highlighting through Rainbow.JS for code blocks in your post, without you having to write any additional code. Has well-detailed documentation, with step-by-step tutorials, for easy installation and the setup process. Offers you the flexibility to have custom widgets, such as the Author Information widget, Tags widget, MailChimp Subscribe widget, and Social Share widget. Offers you access to the Theme Support Centre for submitting tickets or checking out any useful articles about this theme. 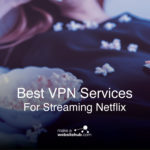 Can be difficult to disable any third-party connections, without the help from the theme support team. Has limited theme styles (just two). Astro is a responsive Ghost Theme, and for better mobile compatibility, it features a responsive layout. The responsive design works well for notebooks, tablets, smartphones and desktop computers, and to display content on these devices effectively, Astro dynamically adjusts to fit the screen of any device. The Astro theme takes the discussion even further with Disqus comments and allows users to interact at the bottom of every post. With syntax highlighting, Astro presents code in a readable way, and to make code easier to digest, it automatically uses Google Prettify to color different blocks of code. The theme takes only minutes to install, and it comes with enough documentation to explain every feature that is available from this theme. Since it’s a responsive Ghost Theme, Astro supports high resolution, and it has no trouble scaling content on 4K monitors, retina displays and smartphones. With simple edits to the configuration file, this theme can be customized, and it offers a variety of features that help to highlight important content. The Astro theme features an article flow bar and supports all of the major Internet browsers, and once you own it, you can expect regular updates. Curious is a blog and magazine Ghost Theme, and as a well-structured theme, it focuses on the content and features a bold design. This theme is easy to set up, and with a responsive design, it’s compatible with all mobile devices. To fit onto any screen, Curious dynamically changes its settings, which equates to a great viewing experience on most tablets, smartphones and notebooks. Since Curious focuses on content, it uses big cover images for posts, author pages and tags, and it uses custom styles for quotes. It also offers effective image alignment and displays content in a magazine format. If you’re looking for a theme for a personal blog, journal or online magazine, the Curious Ghost Theme is worth considering. It’s built for the latest Ghost version, and the responsive layout is accessible on most devices. For a better viewing experience, the icons are optimized for retina devices, and they’ll display correctly on devices that have a retina display. To give multiple authors the ability to contribute, Curious has author page support, and it also supports tag pages. Some other great features are the code syntax highlighter and social media icons. Curious is compatible with Disqus comments and comes with an Instagram feed. It has widgets for recent posts and tag clouds, and it comes with integration for social post sharing. The Dragonfly theme is for Ghost, and since it’s a multi-purpose theme, it’s useful for a variety of applications and purposes. It’s commonly used for agencies, personal blogs and portfolios, and it has support for author and tag pages. Dragonfly comes with features for sorting and filtering control, and to help users find exactly what they need, it comes with a built-in search function. It’s compatible with the latest version of Ghost and features a stylish post ribbon. It’s designed to support static pages, and it’s also compatible with menus. Dragonfly offers three different styles for the home page, and you’ll also have access to two sidebar styles. This theme features a flat design, and it’s fully responsive. It’s built with Twitter Bootstrap 3.0 and offers an infinite scroll feature. Dragonfly allows you to choose from 15 different colors and supports audio, video and image content. For easier code reading, code syntax is highlighted, and the theme comes with seven basic widgets. It allows you to choose from over 500 different Google Fonts and supports Ajax MailChimp forms. The comment system is designed for Facebook, Google Plus and Disqus, which gives users plenty of options for communication. 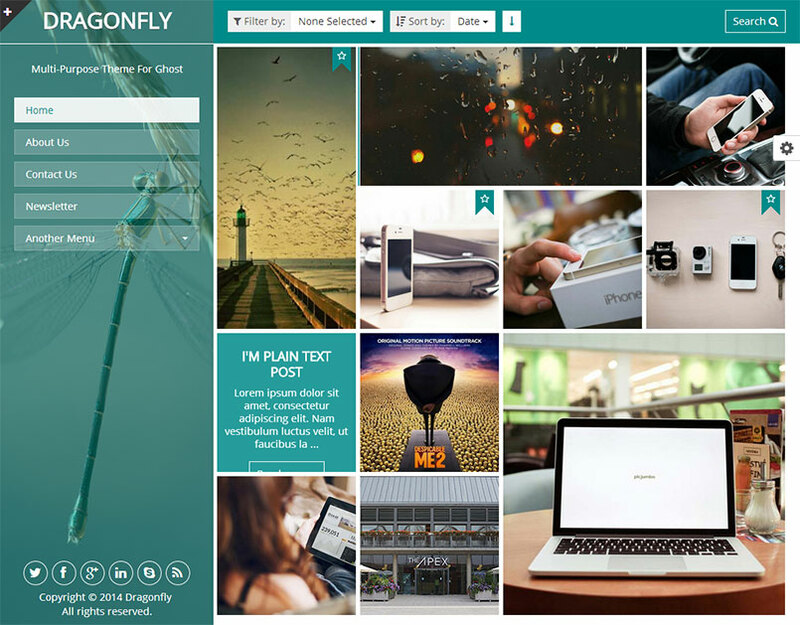 The Dragonfly theme comes with full documentation and delivers cross-browser compatibility. 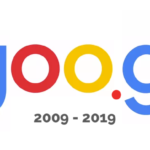 Right out of the box, it works with Chrome, Safari, Firefox, and it’s even compatible with the latest versions of Internet Explorer. The Goblin theme is made for Ghost and features a minimalist design. Since the theme focuses on content, it displays posts and pages prominently, and with a responsive design, it’s viewable on all devices. The Goblin theme can display full-width audio, videos and images and gives you access to useful post formats. 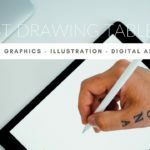 It’s commonly used for journals, portfolios and personal blogs, and the minimalist design can be set up quickly. Goblin offers several different styles to choose from, and it’s compatible with the latest versions of Ghost. Unlike some alternative options, this theme is designed for readability, and it features Schema.org roles, WAI-ARIA and Rich Snippets. It offers multiple home page styles to choose from, and the wide, boxed layout is perfect for portfolio websites. 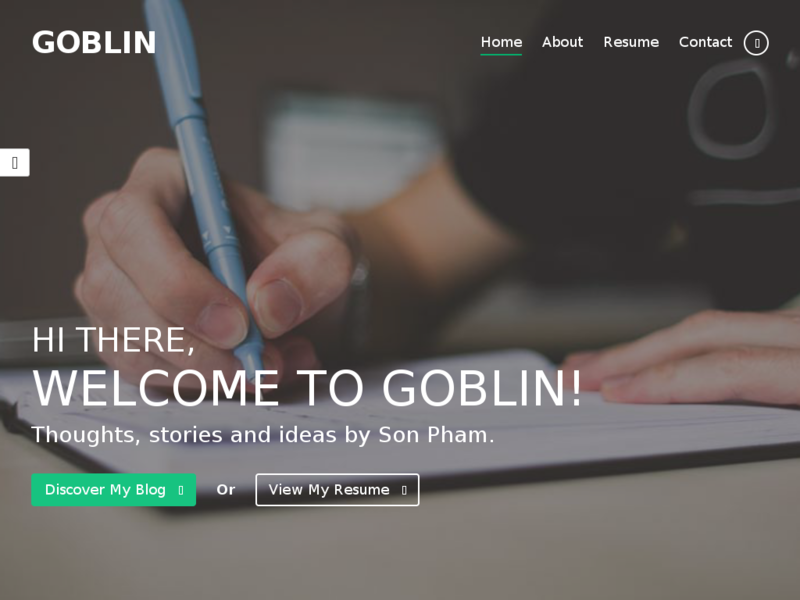 Goblin is designed with a responsive layout and can be viewed from almost any device. It has no trouble displaying content on smartphones, tablets and desktop computers, and it comes with four different style options for the header. Goblin offers four intro screen styles, and you can choose from two site mode options, which are plain text and multimedia. The theme also comes with several style options for the footer and posts. 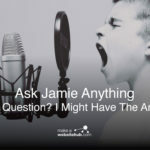 You can select post formats for video, audio, image and text, and a built-in Ajax search function allows users to search and find what they need. RAIN is another responsive Ghost theme, and it’s one of the best-selling themes available. One of the best features that this theme offers is the background, which is 100 percent dynamic. To set up the background, all that you need to do is upload your own photo. RAIN is viewed as a minimalistic theme for writers, and it comes with useful audio files. For copyright reasons, photos aren’t included with your purchase. The RAIN Ghost theme was created to be a modern, professional theme, and since the Ghost platform is intended for bloggers and writers, the unique style of this theme shines through. With a versatile design, this theme is suitable for a variety of purposes, and it’s commonly used for drama, comedy, prose and poetry. If you wish to write essays, science articles, short stories, songs or fairy tales, then this theme was made for you. It allows you to add a featured image to every post, which is great for personalizing your website. 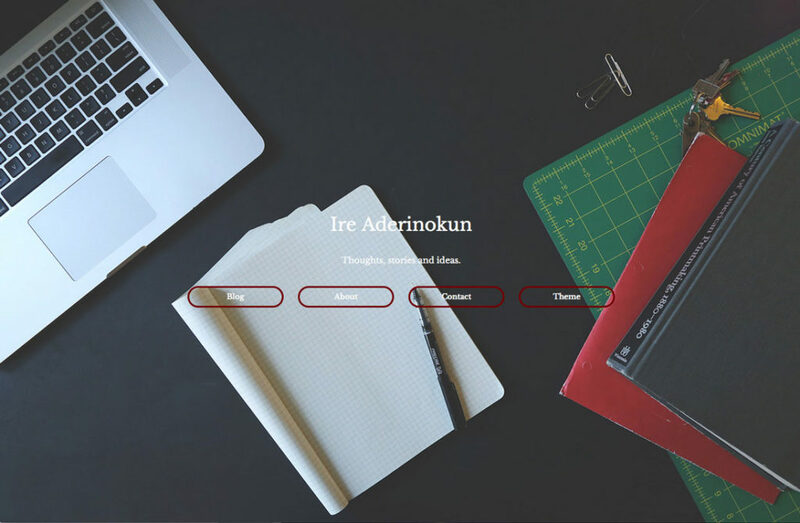 This free Ghost theme has been designed by Ire Aderinokun to help people, especially beginners, understand how Ghost works. It is a simple and easy-to-use theme, with no configuration required. It offers a clean design with parallax scrolling features. OpenWriter supports important Ghost platform features, including tag pages and author pages. It also provides a default cover image for every page and a built-in (pre-installed) contact form. Has a fully responsive design. Is ideal for beginners, as it is a ready-to-use theme, with no configuration required. Offers support for private blogs, despite being a free theme. Is suitable for small businesses or startup blogs. Only offers smaller cover image sizes on subsequent archive pages. Is unsuitable for medium to large enterprises. The modern feel of this theme may convince you that Decode is a premium Ghost theme, but it is not! Decode has been designed by Scott Smith, with the main focus on simplicity and readability. That explains why this theme offers extremely crisp icons, texts, images, graphics, and so on for any screen and at any size. 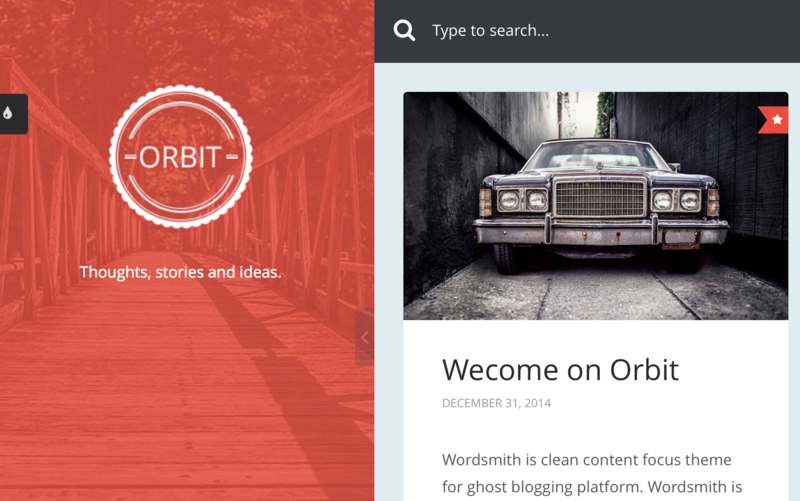 All in all, this theme is one of the finest free personal blogging themes on offer for Ghost. If you want to focus on content, then this theme can be ideal for resumes, technical writings or travel-based blogging. Is mobile first and a very responsive design (appropriate resizing and scrolling options across many devices). Is regularly updated to offer new features of the Ghost platform. Lacks fancy animation or special elements for high-end customisation. Does not support syntax highlighting, even though you can quickly inject Highlightjs or Prism, using their code injection tab. A picture is worth a thousand words. If you are a great believer of this saying and wish to tell stories or present your content through images and graphics, then the Saga Ghost theme is ideal for you. It is a theme designed by Gustav Lindqvist to tell photo stories. Saga enables you to use full-width images by keeping the text in a smaller column (single column layout). The design is clean and light for a photo blog theme. It thus makes your blog look beautiful through creative use of media, with images and even embedded videos. Offers Lightroom effects for images to make them more visually appealing. Allows images to be displayed in four different sizes: small, normal, large and full (support for full-width images). Offers two different ways to display any quotes on your blog. Lacks a built-in menu option. Does not have a pre-installed comments section. Does not have a built-in social media sharing feature. 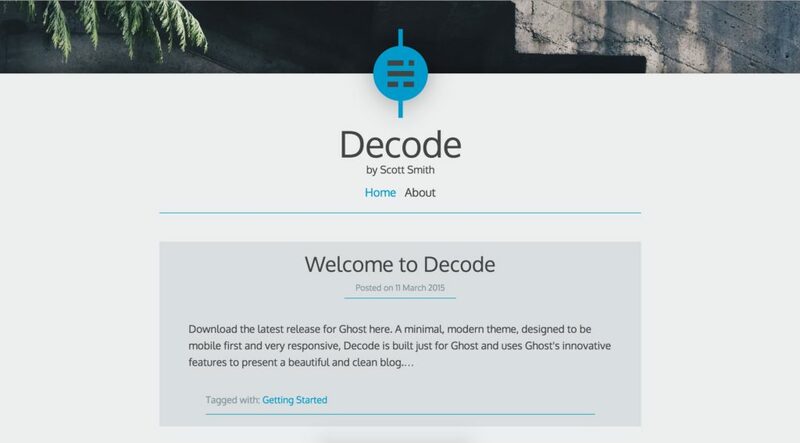 This is another free Ghost theme focused on content, based on a medium design or user interface. It offers high readability and extends support for two columns. It also enables you to get good details of the traffic to your blog through support for the use of Google Universal Analytics snippet. This theme makes syntax highlighting possible through the use of a lightweight syntax highlighter, such as Prism. Has an attractive and easy-to-use navigation menu. Has an interactive and easy commenting system through availability of Disqus comments. Supports asynchronous content loading, resulting in improved page loading performance. Has a long and slightly difficult theme configuration process, especially for newbie bloggers, even though it is well documented. This free Ghost theme is simple, fast and responsive. Foundation 5 has powered FauxGhost and it is based on another free Ghost theme labelled “Ghostion”. This theme offers support for Ruby and Node.js and uses SASS (Foundations SASS variables) which makes it really easy and convenient to change the colour scheme as well as the look and feel. It allows your blog to have a slide-in menu, which is a very eye-catchy feature, and allows you to list your blog site with the author site. To do this, you just need to tweet @moomooio and get your blog included in the list of users on the author site. Has built-in social sharing buttons. Has a search feature implemented which is very rarely found in free Ghost themes. Offers easy configuration by adding settings to a file and using gulp to build the theme. Has no cover photos in the posts, even though this feature is likely to be added soon. Once you start using any of these free or paid Ghost themes or templates, you would see how much effort has gone into these Ghost themes and how well the authors of the themes have managed to pay attention to several minute details related to blogging. If you have any prior experience of using Ghost blogging themes, please feel free to share your experience in the comments section below. Thanks mate. Looks great. I will add it in due course.